The month of APRIL is Autism Awareness Month. As a family affected by autism, my husband and I have been involved in helping raise the awareness of this disorder, especially since the numbers have now increased to 1 in 88 being diagnosed. First of all, we joined Autism Speaks in the "Light it Up Blue" campaign. We have been wearing blue clothes, wearing blue autism puzzle pieces, and using a blue lightbulb on our front porch each night. I also made a CAMPAIGN PAGE to share with those who wish to make a donation. I have already reached my goal of $50.00, however, you are still welcome to contribute if you desire to do so. One of my daughter's therapists (Sarah) has been handling a lot of events and activities in our area to help increase awareness of autism. This past Thursday, my husband was with her and another parent, being interviewed on our local radio station. They will be on again next Thursday. When my 13-year-old daughter was born, I never considered the fact that she might be among the many diagnosed with autism. At that time, I believe the numbers were 1 in 250 being diagnosed, but I wasn’t too aware of what it all meant until my life was personally immersed in it. I quickly learned that autism is a spectrum disorder, which means the symptoms and characteristics of it can appear in various combinations, ranging from mild to severe. No two children are alike. I also learned the symptoms of autism can improve with various therapies and treatments, which is very good to know. Unfortunately, one thing I wish I hadn’t learned is that raising a child with autism also includes being exposed to merciless comments made about you or your child. The comments are not always intended to be hurtful, but they usually come from a lack of understanding about the disorder. With this in mind, many parents have learned to ignore the comments (even though they do hurt) and/or have made efforts to educate those who will listen. That is my purpose for writing this article – not to whine and complain about unfair treatment, but to increase the awareness and familiarity of autism, and to help give others a better understanding of those affected by it. NOTE: Included in this article are actual comments spoken from people who were misinformed about autism. These quotes were specifically sent to me by other parents of autistic children from various online support groups. (You would be amazed at how many comments I received, so weeding them down to a few was difficult.) Permission was granted to publish the comments; however, identifying names have been removed in order to protect the privacy of each one involved. 3. Lynn says: My daughter was “acting up” one day because we were away from home and in a different environment. She may have been hungry or tired, but just didn’t know how to tell me. I was having a hard time getting her to stay calm when my dad’s sister (who was visiting from out of state) asked, “Would she listen better to her grandpa?” implying that my daughter’s behavior was due to a discipline problem and she needed a firmer hand to make her behave. 2. Said to Monica - "Maybe he won't talk because you won't give him the food he wants." 3. One mom shared that her son's school felt she was being abusive because her son was on a restrictive diet for autism. The school said it is unhealthy to deny a child fast food and candy like other kids get. 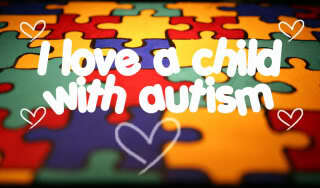 Contrary to what some believe, the lack of speech in an autistic child does not mean the child is without intelligence. Children with autism do learn, and many can be successfully taught to function, when they are given appropriate therapies and treatment. Simply put, autism produces barriers in the brain which does not allow information to process correctly. A child with autism may actually understand what you say, but the barriers hinder the child from being able to respond appropriately. However, many autistic children can develop functional language and others can develop some type of communication skills, such as sign language or use of pictures. Those who are mildly affected by the disorder may exhibit only slight delays in language, but could have a greater lack in social skills. Therefore, he or she may not be able to initiate or maintain a proper conversation. Communication is often described as “talking at others” instead of with them. For example, they may continue to talk about a favorite subject without pausing, despite the attempts of others to interject comments. 1. Monica says: When strangers say “Hi” to my 4-year-old autistic son, I often tell them he cannot talk. Once, I got the comment, "Maybe he just doesn't have anything to say.” One lady actually said, "What did you do to the poor child?" 2. Said to Debi - "She can't be autistic. She's too smart." According to the Centers for Disease Control and Prevention, 1 in 88 children in the United States are now being diagnosed with autism (numbers published March 2012). With the way autism has increased in numbers in the last 10 years, I believe in the importance of making others aware of it. It is now considered an “epidemic.” Chances are, if a family member does not have autism, you will at least eventually run into someone who does. So, when that happens, please remember there is probably a reason why this child is “acting out” in some odd way. With sensory issues, compulsive tendencies, and lack of communication skills, these children are doing the best they can with whatever situation they are in. The parents, likewise, are doing the best they can to keep their child calm, happy, and secure in his world. Instead of making unnecessary comments, be kind and courteous. A simple smile or a pat on the arm can be more encouraging than you realize. 1. Laurel’s son refused to eat meat of any kind due to oral-sensory issues. Someone said to her, “Can't you just reason with him?" 2. Veronica’s son was 3 years old and attending his cousin's christening. Veronica says: He was enjoying the church's different space and trotting back and forth on the sides of the church. Not being noisy, just not sitting down. A staff member of the church came and asked me to control him. I said, “I can't, he's autistic, he is going to scream if I stop him.” (He would have). She told me to wait outside. This was the second time we had been kicked out of a church for family events. "He Holds My Right Hand MINISTRIES" is on FACEBOOK. Click here to LIKE the page. Unless otherwise noted, all contents are © Victoria L. Stankus. If you quote this blog, please cite and provide a link back. Thank you.